The prime minister&apos;s controversial decision to appoint Justice Marc Nadon to the Supreme Court of Canada hasn&apos;t come cheap. 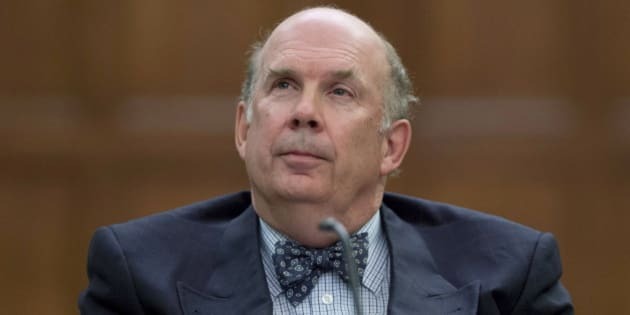 Anticipating debate over the nomination, the government sought to pre-emptively extinguish questions about Nadon&apos;s eligibility by obtaining some esteemed outside legal advice. Documents obtained through Access to Information show those consultations cost more than $11,000. The government paid retired Supreme Court Justice Ian Binnie $7,463.65 to answer the question: "Is a sitting judge of the Federal Court qualified for appointment to the Supreme Court as a Quebec member" if he or she practiced law in Quebec for at least 10 years prior to becoming a judge. In an eight-page report, Binnie replied yes. The government then went one step further and asked retired Supreme Court Justice Louise Charron and renowned constitutional expert Peter Hogg to conduct their own reviews of the Binnie opinion. Both endorsed Binnie&apos;s findings. Charron was paid $4,325 for her time. The documents do not reveal how much Hogg was paid and when contacted by CBC News, Hogg said he regards that information as confidential. In the minds of many legal observers though, all three distinguished legal experts lacked one critical qualification for opining on the Nadon case — being a Quebecer. In releasing the information, the department of justice Access to Information officer released 237 of 460 pages, but almost every page is blacked out, save for the date, salutation and signature on every email. The officer explained most of the information is redacted because it is either personal, financial, confidential advice or covered by solicitor-client privilege. Ultimately, the federal government&apos;s efforts to appease critics of Nadon&apos;s appointment did not deter the Quebec attorney general and Toronto constitutional lawyer Rocco Galati from challenging whether the judge is eligible for the job. That, in turn, forced the government to make declaratory amendments to the Supreme Court Act and refer questions about Nadon&apos;s eligibility to the Supreme Court of Canada for a five-hour hearing on Jan. 15. The court reserved its decision.